the longest for pre-stressed Lintels in Scotland – bristles with innovative features. At Robeslee, quality is built on investment – in technology and people. Technology, such as computer-controlled batching ensuring mixture and consistency remain the same. Batch after batch after batch. Allied to experience and the craft skills that come from it, with an unerring commitment to customer service – these are the foundations of Robeslee Concrete. Our facility has developed over the decades, many aspects being built to our own specification and design, so that we meet and exceed the expectations of the marketplace to create the best choice, the highest quality AND the most competitive cost. The facility is unique within the industry having been built specifically for purpose. 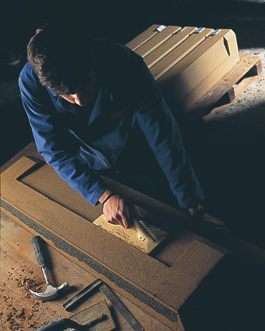 Within our Precast facility, skilled craftsmen combine the best plant with in-depth knowledge to create one of the best selections of concrete products including Cills, Steps and Copes. All production is co-ordinated and costed using latest generation applications in order to accurately assess and minimise lead times and maintain our reputation for exceptional value. Technology, allied to superb craft skill and an unerring commitment to customer service. These are the foundations of Robeslee Concrete.